0:13 - How did Chris get started with Cryptocurrencies? 1:15 - Is Chris confident of Cryptocurrency as a long-term investing asset? 3:08 - How much of your portfolio should you expose to Cryptocurrency? And who should invest in Bitcoins? 4:25 - Is Bitcoin a Bubble? and...is it too late to invest in bitcoin today? 6:04 - Altcoins: How should a cryptocurrency trader/investor allocate into Altcoins? 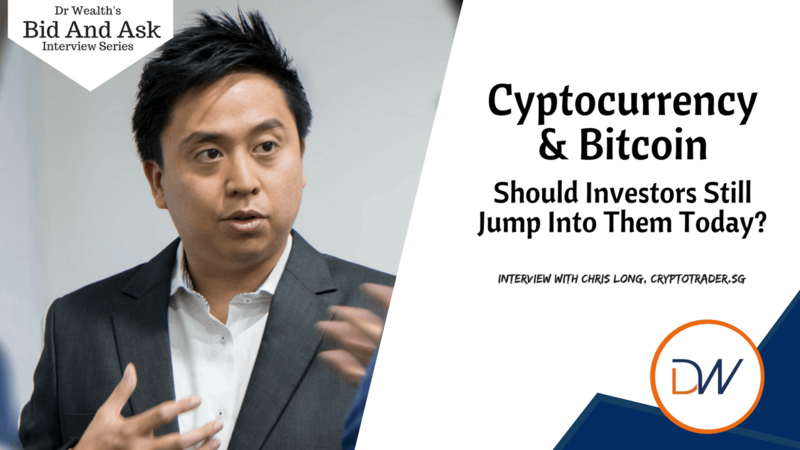 Cryptocurrency analyst and Founder of Cryptotrader.sg, Chris brings a wealth of cryptocurrency knowledge to his students. Chris holds MSc Applied Finance from the Singapore Management University and is the sole recipient of the 2015 Columbia Threadneedle Investment Award. He has been working in the banking industry as an investment banker before starting CryptoTrader.sg in 2017. Chris now aims to share his knowledge and help others achieve the same level of success. What are your thoughts on Cryptocurrency and Bitcoins? Would you still invest in them? Let us know in the comments below! P.S. Interview was done in early Jan 2018, although prices have moved, we think the information shared here is still valid today.